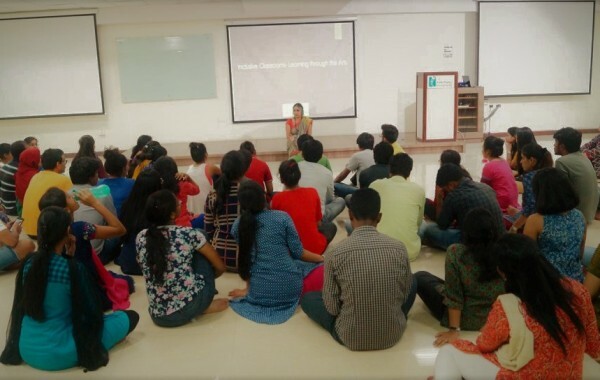 Our work with colleges is two fold: one to work with the children using creative interventions thereby prepare them for inclusion and second is to support the learning of children who learn differently. This aims to create readiness in schools for inclusion using the resources and the infrastructure that they have. Taking Arts based creative interventions into classroom settings looks at learning opportunities for all. 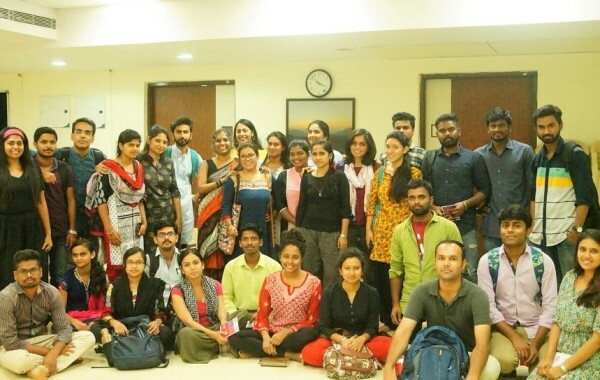 Over a series of sessions titled ‘Inclusive Classrooms- Learning through the Arts’ worked with the MA Education students at APU, Bangalore. The objectives of the workshop series with the students were to understand inclusion in a larger perspective than as applicable to the disabilities sector alone; to welcome and affirm the learner from where he/she is without the burden of labels weighing upon the learning strategies and in the process reimagining learning spaces and facilitation through this lens of inclusion and to understand the role of the Arts in innovative facilitation, self-discovery and meaningful, compassionate, learning and in the process relook at ‘learning’ vs ‘treatment’. Our work with this group was to primarily introduce the group to a vocabulary of creative arts-based techniques to examine the way one learns. So far we have worked with three groups and it has been a lot of learning for us to watch the youth with their ideas of change. The workshop series was filled with experiences, challenges, fun and risks the group took together.